For those facebook accounts that have the feature here's how to do it: facebook help. Prior to the event, there was a press release and a video trailer. Kerry was joined by Special Constable Lee Page as co presenter and a camera man. The three person setup helped tremendously (in my opinion) to help everyone relax and focus on a production role. For example, Sc Lee to find and ask the public's questions (from a smartphone). And Kerry to answer those questions. With ten broadcasts taking place in six and a half hours, that's one video every 40 minutes. Each one had a new location. And all were clearly labelled using the hashtag #WMPLive - used for facebook, at twitter and the web ie a google search. 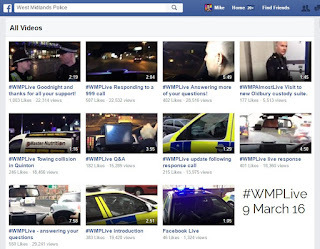 It's worth noting, the hashtag #WMPLive was first used on 21 June 2013 (ref tweet). 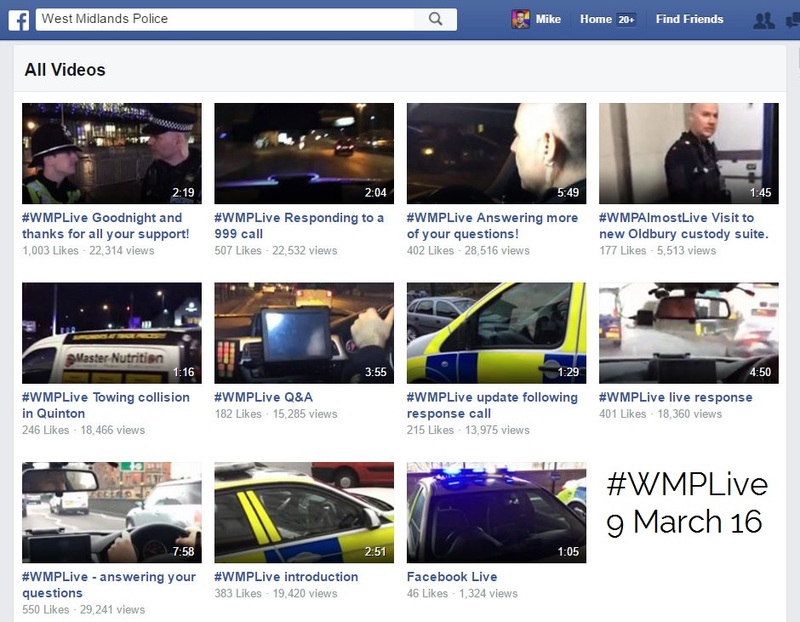 West Mids Police posted the next morning on it's website (10 Mar16) with: Tens of thousands make #WMPLive a huge success on Facebook. So what do you think? If you're from Law Enforcement and Police and want to engage with your community, follow these steps - and if you liked what you saw or have a question, then send a tweet to @kerryblakeman. 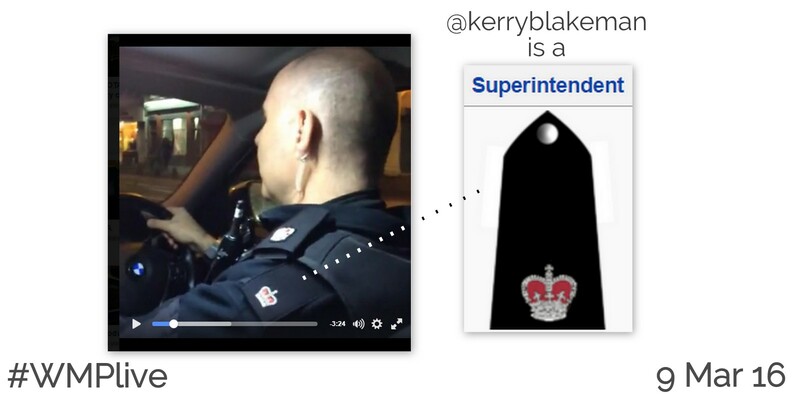 I've included the slide on the right to show Kerry Blakeman's Police Officer rank. I would say it's quite rare to see such a senior officer taking his time out to broadcast in this way. For children reading this post, or for those who are curious - ranks in the UK Police are: Constable, Sergeant, Inspector, Chief Inspector, Superintendent, Chief Superintendent, Assistant Chief Constable, Deputy Chief Constable and Chief Constable. And what makes West Midlands Police such a social force is how the new Chief Constable Dave Thompson even makes time to tweet, Hearing great things about #wmplive ! This post has also been made with a view to informing those attending the next SMILE Conference on 25-28 April 2016 in Alexandria, Virginia- always a few days of healthy discussion on the use of Social Media, Internet in Law Enforcement. Endpoint, Google docs now have a feature to download a file as ePub. This means making your own eBooks to be read in Google Books or an ePub reader on mobile or tablet. 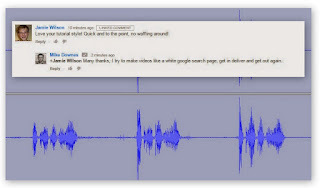 I'm experimenting with this idea now - you can find a raw demo at: Kerry Blakeman at whatsinKenilworth.com 2011 to 2015. Video - 7 .. #WMPLive #WMPAlmostLive Visit to new Oldbury custody suite. #WMPAlmostLive Visit to new Oldbury custody suite. Video - 8 .. #WMPLive Answering more of your questions! #WMPLive Answering more of your questions! #WMPLive Goodnight and thanks for all your support! This afternoon from around 4.30pm we’ll be giving you a LIVE video insight into response policing using Facebook Live for the first time!We'll use the new live video broadcasting feature to take you to live incidents as they’re called in across the region.Superintendent Kerry Blakeman – who was named ‘top cop’ at last year’s international SMILE conference – will be on hand to explain how we work to keep people safe, 24 hours a day.We’ll also be answering YOUR questions during the broadcasts which will begin this afternoon and carry on into the evening.Follow #WMPLive to join in!